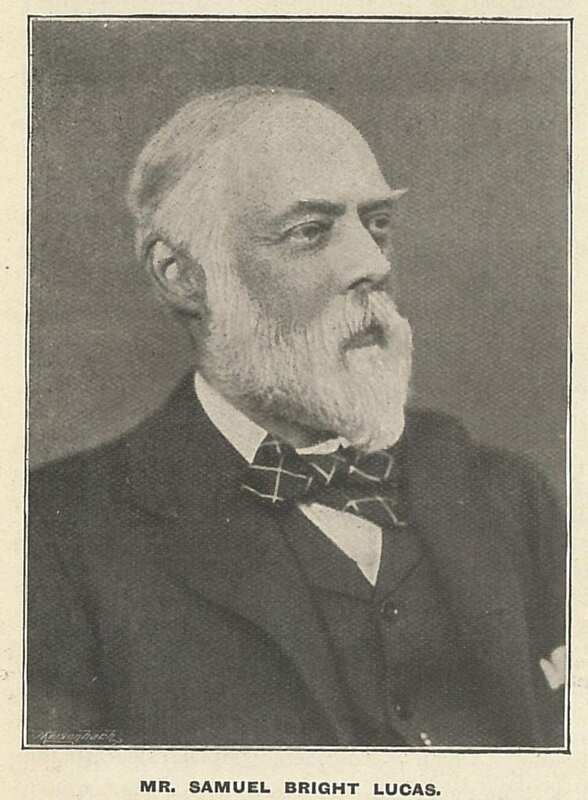 Samuel Bright Lucas (1840-1919) was born in London into a notable family of Quakers. An uncle of his was the radical M.P. John Bright, famous for his opposition to the Corn Laws. His mother, Margaret Bright Lucas, was a temperance league worker. He lost his hearing as a child (Ephphatha, 1899). He was tutored privately, and also taught by a ‘Dr. Webster’ of Bristol. Thomas Webster was born in Ireland, around 1818 – I say around, as the census returns vary with both the place of birth and his age. The place seems to be Gorey in Wexford, but one census says Cork. Trained at the Claremont School, he was a male assistant teacher in 1834 when he was earning £20 (Pollard, 2006 p.67). The Claremont 20th annual report says (p.33) he was appointed on the 29th of July, 1835 because of the increase in the number of pupils. The Claremont school had major problems, and in 1842 Orpen resigned for health reasons and the superintendent the Rev. Charles Stuart Stanford also resigned. Stanford must have been influential enough on Webster for him to later name his son Charles Stanford Webster (b.1861). Webster took responsibility for the junior teachers at that time, but the place was in a state of chaos. We do not have Claremont reports for that period unfortunately – you can read more about this in Rachel Pollard’s book. Webster left around this time – perhaps he was partly responsible for the dismal state of affairs there at the time. At any rate he got a place at the new Bristol Institution, and was there by 1844 (Quarterly Review p.67). He replaced Matthew Robert Burns, and was head when they moved to Park Row, Bristol. He was head there in the 1851 census. He left the school in 1852. There is a Bristol website here which calls him Robert Webster and says he was booted out by the governors when they discovered he had plans for a private school in Redland. The same website points to Webster’s private school in Malvern House, Redland. However the Quarterly Review article says that he left to pursue medical studies, and was still practicing in Bristol in 1892. I was initially suspicious to see he described himself in censuses as a doctor, but this seems to explain it, though the Bristol website pages above suggest that he was something of a quack doctor. He died, in Bristol, in 1910. Quite when Lucas was his pupil I cannot say, but if it was at the school it would be before 1851, if as a private pupil perhaps between 1852 and 1856. According to Gilby’s obituary of him, Samuel also trained at the Royal Academy School of Art (Ephphatha, 1919). That should be possible to find out more about his time there, but as Gilby says , ‘he never followed it up as a profession in life’ (ibid). At one time he seems to have been involved in a photographic business, at least that is what this website suggests. Otherwise it seems he was able to live on his inherited wealth. He was a friend of Gilby’s father, and knew Matthew Robert Burns and Samuel Smith, the chaplain to the Royal Association in aid of the Deaf and Dumb, on whose committee Samuel served for many years. He was President of the National Deaf and Dumb Teetotal Society, and Hon. Sec. of the Charitable Provident Society for granting Pensions to the Aged and Infirm Deaf and Dumb (Ephphatha, 1919). Gilby says of him, “Very quick in his sympathies, he would blaze out against what he imagined to be any injustice or wrong of any sort” (ibid). His first wife was Welsh, Jessie Oliver, daughter of a farmer from Merionethshire. She was born in Dolgelly (Dolgellau). They married in 1868, but she died on the 1st of January 1900, and he married again, to a Mrs. Parker of Passage West, Ireland. His daughter, Margaret, married Wellesley Edward Rudston Read (1852-1934), who was deaf from aged 5, according to the 1911 census. Rudston Read was on the committee for the Royal Association of the Deaf and Dumb. Like Bright Lucas, he was of independent means. Samuel’s son Charles, a journalist, predeceased him. The 1899 Ephphatha article takes the form of an interview. Born in London, 4th of July 1840, died in Cork, 6th of November, 1919. Pollard, Rachel. The Avenue – a History of the Claremont Institution, 2006.